The next Nursing School Intake will be advertized in the Herald in June or July. Interviews will follow after that, and then the new class will start in September. If you want to be considered for the class, you must respond by mail to the advertisement in the paper and do what the advert says. There are no email applications. You can also hand carry your application to Karanda. If you are not invited for the interview, that is the end of the application process. Please be aware of scams. Karanda never takes payment for acceptance into our nursing program. The school of nursing opened its doors in 1962 with the purpose of helping to meet staffing needs of the remotely located Karanda Hospital. It is our intent to train quality nurses who are able to minister effectively within the local church no matter where they work. Over the years, the school of nursing has adapted to provide nursing education that best meets the needs of the country under the directives of the ministry of Health and Child Welfare. Since 2001 we have been training Registered General Nurses in a three year diploma program. Our student body numbers 44 with three levels of training at any given time. We also have a one year State Certified Midwifery School which opened in 2005. We have 10 students each year in the program which is a post basic course for Registered General Nurses with at least 2 years of working experience. Our school operates within the parameters of the Zimbabwe Ministry of Health and Child Welfare and the Nurses Council of Zimbabwe. The school of nursing continues to meet a critical need for quality nurses within the country. The HIV/AIDS pandemic requires nurses prepared to meet the challenge of providing holistic health care that is promotive, preventive, curative and supportive in nature. The country is still very supportive of the Karanda School of Nursing. We are still able to openly teach God’s Word to our students in training. Our students have 3 hours of instruction in Bible every week they are in class. The students spend 40 weeks in class time and the rest of their time working at the hospital getting practical experience. Included in the 3 year general nurses course is an 18 week component of community health nursing experience. The students spend 12 weeks of that time working with our community program and then 6 weeks in the urban community environment in our Provencial capital. 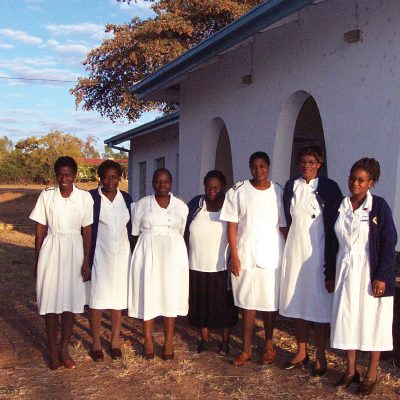 Community nursing is a big part of what is done in nursing in Zimbabwe. If we had more staff in the school of nursing this is a component that could use further supervision and development. The school of nursing invites nurse educators from overseas to come and assist in the teaching of the student nurses for a few weeks, months or longer. This is possible because English is the official language in Zimbabwe. Other nurses are also encouraged to come and help in the clinical supervision of students on the wards. We need nurses who can mentor our students in the clinical area. Nurses could even come during the North American summer as our students are in school year round. All such nurses would be required to be registered by the Nurses Council of Zimbabwe. What an opportunity to build into the lives of African nurses! We would also welcome a partnership with a Christian School of Nursing in the US in which nurse educators could come and help teach in our school and/or our nurse educators could work at their school during their home assignments. We currently have a school staff of 2 missionary nurses, 1 national nurse educator and 3 national clinical instructors.